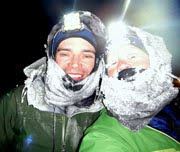 I was speeding down a steep descent on the North Douglas Highway, tears freezing to my cheeks in the windchill and ankle still throbbing from an earlier spill, when I saw a dark figure in the distance. At first I thought “jogger,” but it was going to fast, approaching me with shadowy urgency, and my second thought was, “Oh crap! It’s a moose!” My heart shot into danger mode as my eyes darted back and forth, confirming that, yes, there was still a cliff directly to my right and the channel on the left. I had no way to escape and this moose was coming right for me and surely it would stomp me to death right here on the road before I ever got the chance to visit Antarctica or catch up on my New Yorker reading. But wait ... there are no moose in Juneau. I squinted at the figure and realized there was another animal right behind it, and behind that, headlights. It took me several seconds to figure out they were two horses - like moose, an animal I have actually never seen in Juneau - that were apparently either being chased or herded by a Department of Fish and Wildlife vehicle. It was hard to tell which. I pulled all the way off the road and watched as they went by, their wild eyes fixed forward as they pounded across the pavement. I decided they were being chased. Not even ten minutes earlier, I had been writhing in pain on the Rainforest Trail. The trail, which is best ridden in laps, is a short, narrow stretch of raised singletrack that is more fun that can be justifiably had in a half mile. It was built for walking, not cycling, and its turns are really tight. If I don't hit them right, my rear wheel falls six inches off the log-lined gravel - a drop I have not yet learned to take without tumbling. I took two slow-speed spills while riding down. Then, while climbing back up with a maximum heart rate clouding my vision but gravity on my side, I somehow tipped over without even leaving the trail. My right foot stayed lodged in the cage and my ankle wrenched sideways. The initial shot of pain was awe-inspiring ... the kind if quick, intense moment in which you taste metal and see angels. 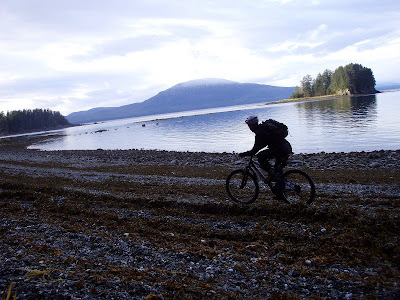 It was a moment in which I convinced myself my ankle was broken, and I laid in the mud, still lodged inside my bike, gazing up at the silhouettes of trees in a sea of white shock. It’s strange how sometimes the most intense pain ends up being nothing at all. I have limped for months on nagging soreness, but after a few seconds of stillness on the Rainforest Trail, my ankle pain had subsided. I slowly removed my foot from my bike and rolled it around a few times. No pain. No injury. Perfectly fine. Strange. And then the horses. Those were strange minutes, those ten minutes. I essentially spent all of my adrenaline for the day, and the ride home disappeared into a sleepy blur. Now that's pretty darn cool. I wonder what those horses were doing on the highway. Did they escape from someone's paddock, or were they wild? 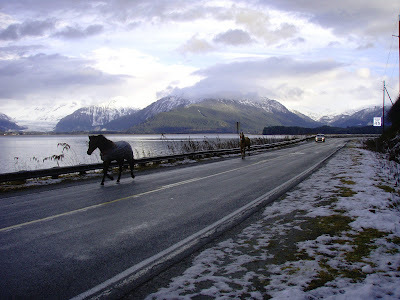 I've never heard of any wild horses in Juneau, but that doesn't mean there aren't any. Alaska has it all, no? Reminds me of a friend''''s father who lived in an isolated outport in Newfoundland. To make a long story short. He spent a long time in a ditch betwen two villages being chased by a ghost in the dark on the road. Turned out to be a white mare standing in front of him on the road in the dark. He realized this come dawn. Cool! I'm in a book! I'm going to be on NPR!